Hello! 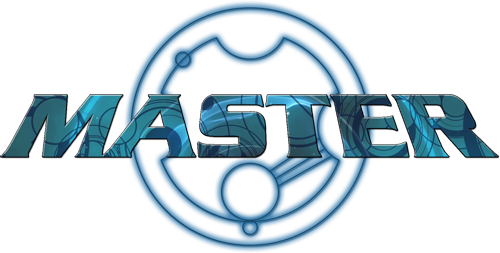 This thread will contain all my tools for Rayman 2 modding/reversing. Yes, you're right. I want to remake Rayman 2 (or make a new engine) in the future. A tool used for exploring CNT file contents. For now, it only allows you to open and view contents of CNT files, but I'm making a possibility of saving textures. To open a file, use menu or just drag and drop in on the program window. By double clicking images, you open them. Right click allows you to save them as bitmaps. 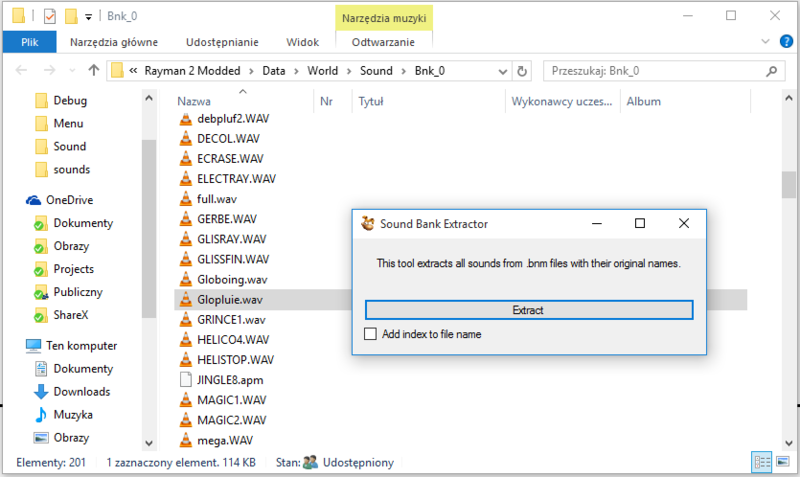 Extracts sound files from .bnm. Currently it can't save them back to .bnm. Last edited by szymski on Sat Nov 28, 2015 11:55 pm, edited 5 times in total. Cool! 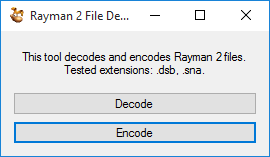 It seems to work with the Rayman 2 demo as well and I'm currently looking for any differences. 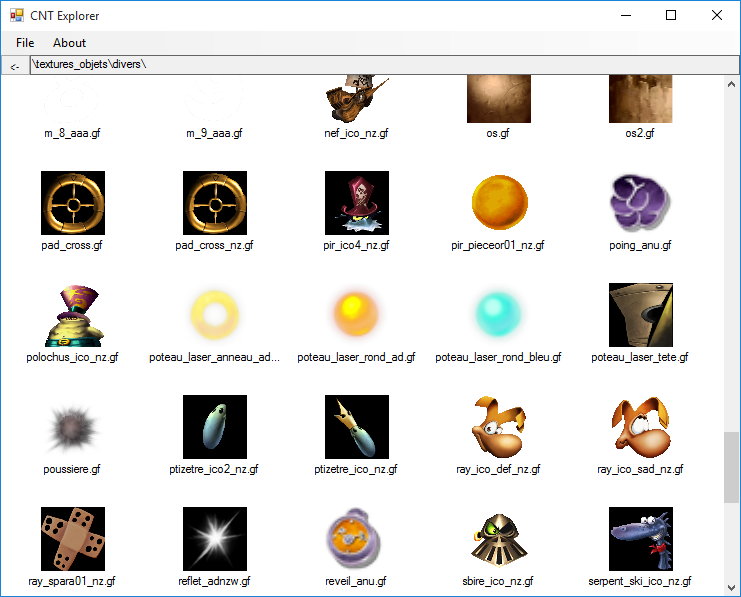 I found textures for darktoons, which appear in the PS1 version of Rayman 2, in the demo files. And Jano might have been meant to be the fourth guardian as info about him is under the fourth temple folder which is about cave of bad dreams. It might be made before, but it wasn't opensourced. I'm making a special library for Rayman 2 by the way. Carrot-master wrote: Cool! It seems to work with the Rayman 2 demo as well and I'm currently looking for any differences. I found textures for darktoons, which appear in the PS1 version of Rayman 2, in the demo files. And Jano might have been meant to be the fourth guardian as info about him is under the fourth temple folder which is about cave of bad dreams. Hmm, so this tool does the same thing as MixerX's, but it's open source, and thus the means through which it's able to get to the R2 textures can be deduced? If this is open-source, where is the source code? I would be very interested to study and even contribute to this. RibShark wrote: If this is open-source, where is the source code? I would be very interested to study and even contribute to this. Github extension for Visual Studio doesn't seem to love me. Try using GitHub for Windows instead if you are unfamiliar with the CLI. I don't think the Visual Studio extension works very well. 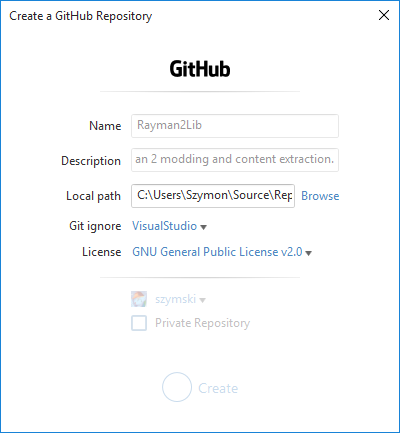 EDIT: looks like you have created a repository but haven't pushed anything to it yet. Uhm, where does that polokus icon appear in rayman 2? i didn't play the game for a long time. It doesn't. There are quite a few textures in the Rayman 2 files that we've found to not show up in the final game. We discussed it in a few threads when a previous texture ripping tool was unveiled. Master wrote: It doesn't. There are quite a few textures in the Rayman 2 files that we've found to not show up in the final game. We discussed it in a few threads when a previous texture ripping tool was unveiled. Sorry but I'm fairly new here so I didn't know about that Where was the original discussion about the differences? I've cloned the repo and when opening the solution in Visual Studio it says that a project DATReader is missing. Are you going to make a reader for LEVELS0.DAT? That would be amazing! Thanks for the links! I've checked through most of it now so I'm more "up to date" on what's been found and not. That would be nice to finally get opportunity for saving textures again. That will open a way to copy DC textures to PC version. They have a better resolution or something.